The Song of Songs has provided generations with some of the most passionate and most lasting love poetry ever recorded. And because of that passion, it has also been a source of lasting controversy and debate. What exactly is the true meaning of these 117 verses -- a celebration of romantic love, or an allegory of divine love and redemption? This new edition is a breathtakingly beautiful illuminated work in which these two lines of interpretation are harmonized within a stunning visual context. 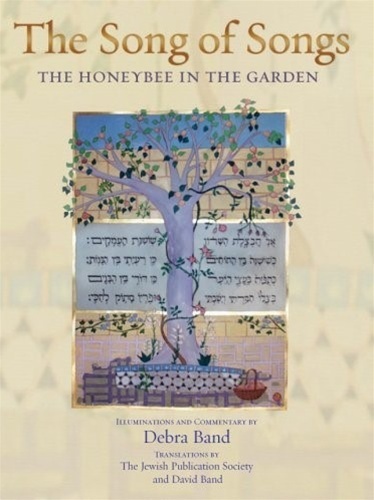 Debra Band's fine calligraphy and striking artwork are like The Song of Songs itself, both literal and allegorical, sensuous and spiritual. 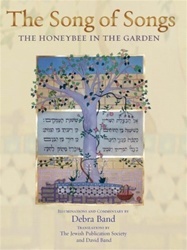 The art is accompanied by the artist's interpretation of the images, and it includes the Bible text in its original Hebrew, next to both the JPS English translation and the new David Band translation. The preface, by Raymond Scheindlin, eminent scholar of medieval Hebrew literature at The Jewish Theological Seminary, provides the framework for truly understanding Band's artistic achievement and scholarly contribution. This work, hailed as a masterpiece by art-lovers and scholars across the world, is an art-book collector's delight, a Bible devotee's treasure, and a magnificent gift for weddings, anniversaries, and other special occasions.